Emails recently released by the State Department give more information on how a securities trader and big-money Clinton donor was appointed by her office to the International Security Advisory Board (ISAB), a group that advises the Secretary of State on nuclear weapons and other security issues. According to the State Department’s own website, members are “national security experts with scientific, military, diplomatic, and political backgrounds.” The current members show a lot of generals, ambassadors and academics. So it seemed odd to ABC News that Clinton felt that Rajiv K. Fernando, above, qualified for the group, since his background is in high-frequency stock trading and Internet “ventures.” He has donated heavily both to the Clinton Foundation, Hillary Clinton’s two presidential campaigns, and the Obama campaigns. The newly released emails show he was added to the panel by then Clinton chief of staff Cheryl Mills. ““Raj was not on the list sent to [the Secretary of State]; he was added at their insistence” reads one 2011 email from Wade Boese, Chief of Staff for the Office of the Under Secretary of State for Arms Control and International Security, to a press aide. — Fernando declined to comment at the time, and promptly resigned from ISAB. — The Clinton campaign declined to comment. Why did she decline to comment on a person she hand-selected to advise her? If it’s all just a witch hunt, say so, and explain why. — The State Department put out a statement saying the ISAB is meant to reflect “a balance of backgrounds and points of view.” Including apparently unqualified points of view. That’s diversity, Clinton-style! 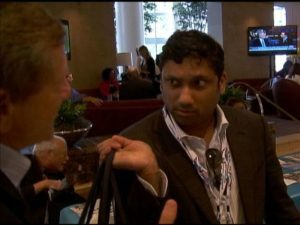 BONUS: Raj Fernando is a superdelegate for Clinton!